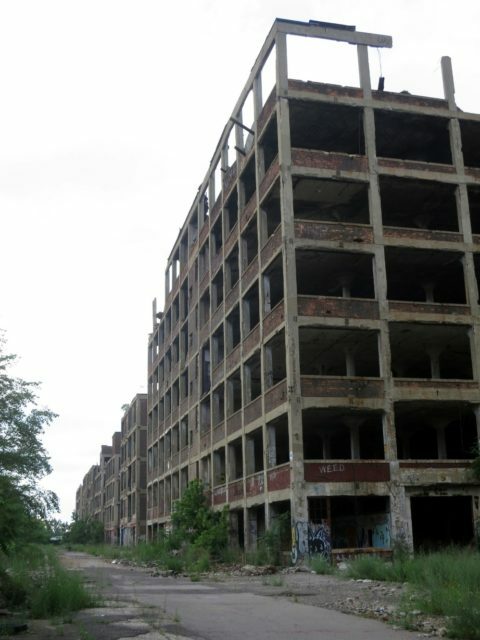 A former automobile-manufacturing factory in Detroit, Michigan, The Packard Automotive Plant was the place where luxury cars were made by the Packard Motor Car Company and later by the Studebaker-Packard Corporation. 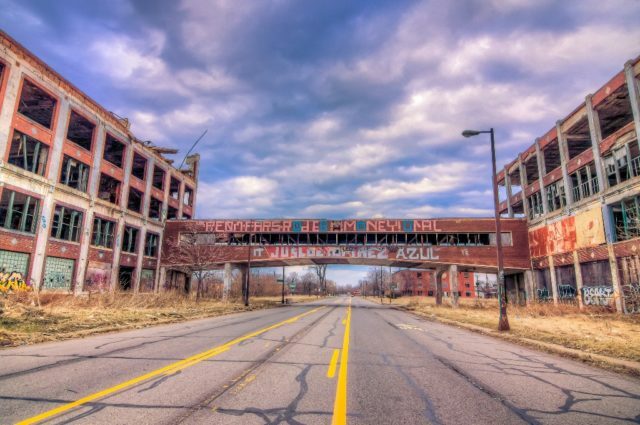 When it opened in 1903, Packard’s Detroit plant was the most advanced auto factory in the world with skilled craftsmen involved in over eighty trades. 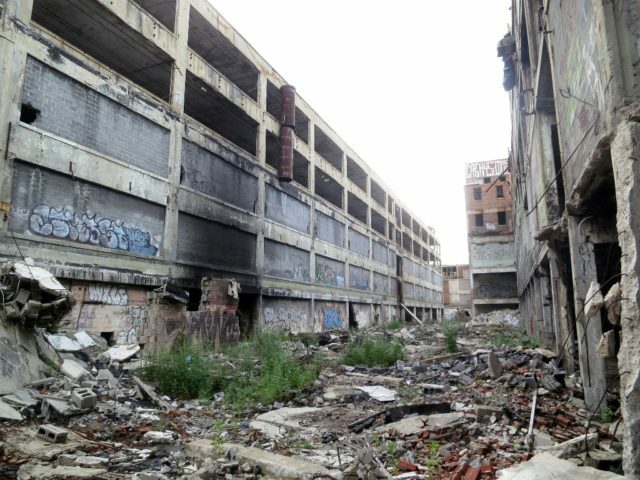 This massive factory complex closed in 1958, though other businesses operated on the premises or used it for storage until the late 1990s. 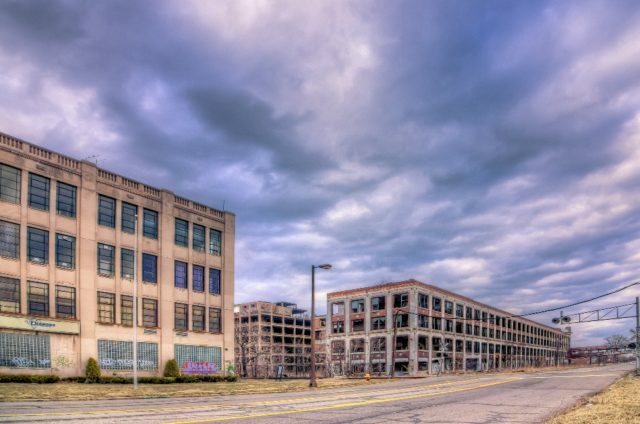 The 3,500,000-square-foot (325,000 m2) plant was designed by famous Michigan architect Albert Kahn Associates using Trussed Concrete Steel Company products. It is located on 40 acres (16 ha) of land on East Grand Boulevard on the city’s east side. It included the first use of reinforced concrete in the United States for industrial construction in the automobile industry. 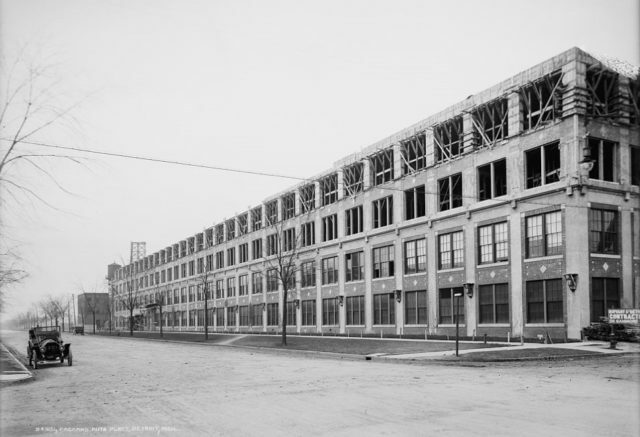 Following World War I, during the 1920s Packard began the transition from hand assembly to an assembly line. It was also during the 1920s that the company solidified its reputation for exceptional engineering and became known as one of the highest quality luxury vehicles produced in the United States. A number of the outer buildings were in use by businesses up through the early 2000s. 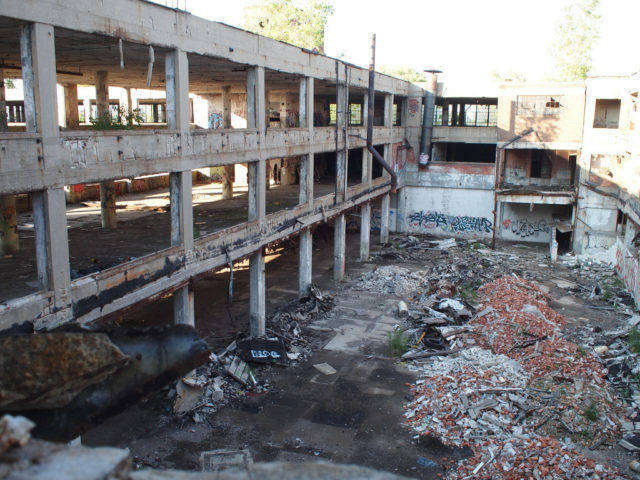 In 2010, the last remaining tenant, Chemical Processing, announced its intention to vacate the premises after 52 years. Upon liquidation, the remaining pre-war Packard designs and tooling were sold to buyers around the world. 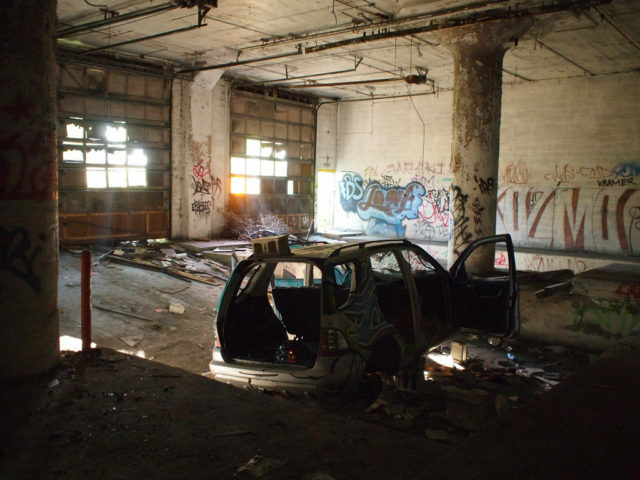 Since its abandonment, its gaping, debris-filled spaces have drawn photographers and gawkers, scrappers, paintball games and rave parties. In one incident, vandals pushed a dump truck from the fourth floor. 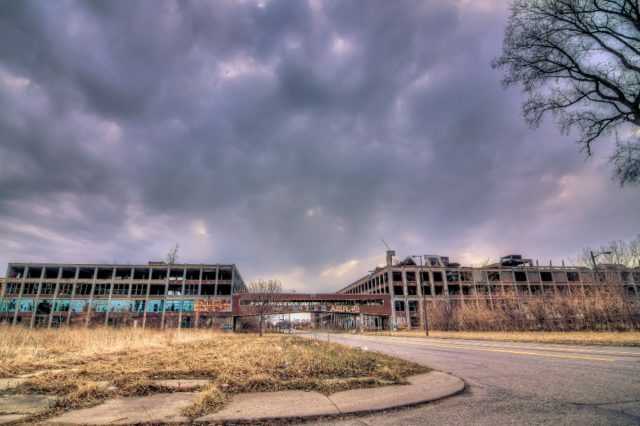 Karen Nagher, the executive director of the nonprofit organization Preservation Wayne, stated that she was irked to see people come from “all over the world” to poke around Detroit. 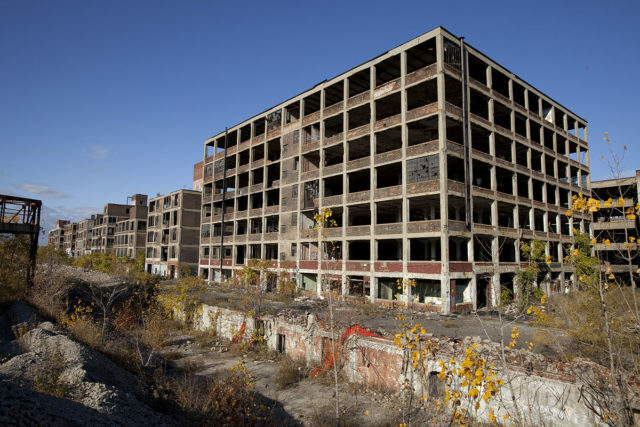 “Piece by piece, they’re disassembling those buildings, making it harder and harder to restore them”. Despite many years of neglect and abuse, the reinforced concrete structures remain mostly intact and structurally sound. 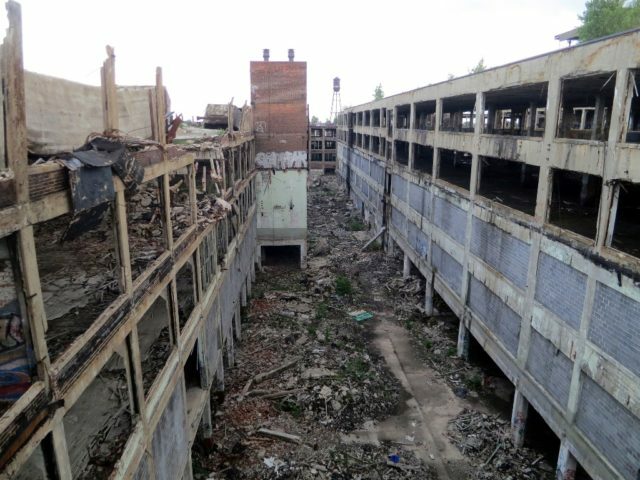 Portions of the upper floors of several small sections in various buildings have collapsed or been partly demolished and lay in ruins in the wake of several aborted attempts at demolition over the years. 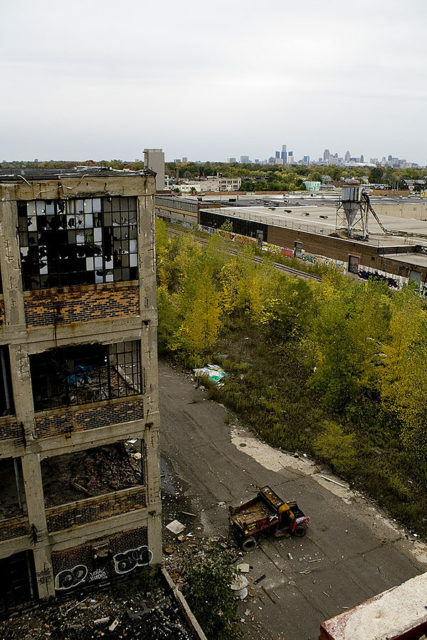 The City of Detroit has pledged legal action to have the property demolished or secured. Dominic Cristini, whose claim of ownership is disputed, was said to be conducting construction surveys in advance of full-scale demolition as of early 2012. On February 5, 2013, it was reported that aluminum letter placards spelling the Nazi Slogan “Arbeit macht frei” (work makes free) were placed in the windows of the E. Grand Boulevard bridge. Community volunteers promptly removed the letters. 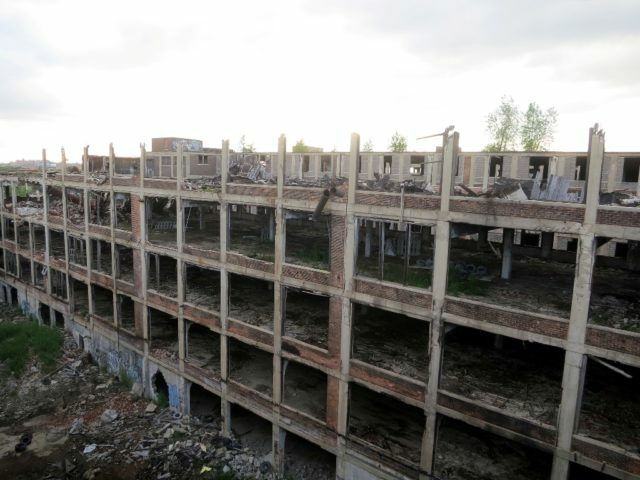 Due to tax delinquency, the 43 parcels comprising the plant were put up for auction in September 2013. The starting bid was $975,000 (the amount owed in taxes) and there were no takers. 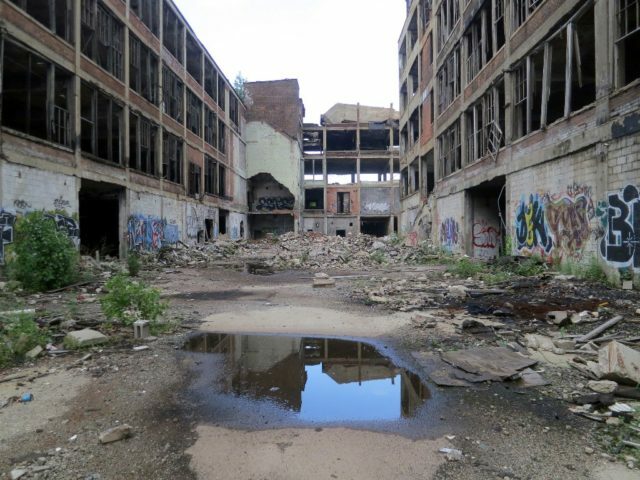 The future of the development is unclear, but the idea is to redevelop the Packard Plant as a mixed development of а residential and commercial property.